Governor Bill Richardson, the former Governor of New Mexico, came to Delaware to advocate for Senate Bill 19, the bill to repeal the death penalty. The following are his remarks from a press conference at Legislative Hall in Dover, DE on March 27, 2014. It’s my first visit to your beautiful Legislative Hall and while it is physically smaller than our “Round House” in Santa Fe, the issue before you—life or death—is as big and as important as it gets. I am here to support the effort to repeal Delaware’s death penalty, Senate Bill 19. I’d like to thank the bill’s sponsors for hosting me today: Sen. Karen Peterson (D) and House prime sponsors, Rep. Darryl Scott (D) and Rep. Joe Miro (R), as well their other 11 House co-sponsors, many of whom are here with us today. That’s 13 House sponsors, Democrats and Republicans, out of 21 votes needed for House passage. I commend these sponsors for their work. As many of you know, just over five years ago I signed into law the repeal of the death penalty in New Mexico. Throughout my adult life, I had been a firm believer in the death penalty as a just punishment–albeit, only in very rare instances and only for the most heinous crimes. But during my two terms as Governor of New Mexico, I started to challenge my own thinking on the death penalty. The prospect of either decision was extremely troubling. But I was elected by the people of New Mexico to make just that type of decision. In the past, I had believed that the death penalty served as a deterrent to some who might consider murdering a law enforcement officer, a corrections officer, or a witness to a crime. But people continued to commit such terrible crimes even in the face of the death penalty. Let’s be candid here — there are decent, responsible people of good conscience on each side of this vitally important public policy issue. And yes, they disagree strongly. However, what we cannot disagree upon is the finality of this ultimate punishment. Once a human being is executed, that act cannot be reversed. Regardless of my personal opinion about the death penalty, I did not at that time nor do I at this time have supreme confidence in the infallibility of our criminal justice system as the final arbiter of who lives and who dies. If the state—in this case, Delaware—is going to take upon itself this awesome responsibility—life or death—then the system to impose the death penalty must be perfect and can never, ever be wrong. But the reality is that our system is not perfect—far from it. In fact, the system is inherently defective. DNA testing conclusively has proven that. In some cases, new evidence is brought to bear years after a verdict has been rendered. Witnesses recant their testimony. The fact is that innocent people have been put on death rows and put to death all across the country. It also bothers me greatly that minorities are overrepresented in the prison population across our country and on death row. According to the NAACP’s Legal Defense Fund, Delaware has the highest minority population on death row of any state, at 78%. 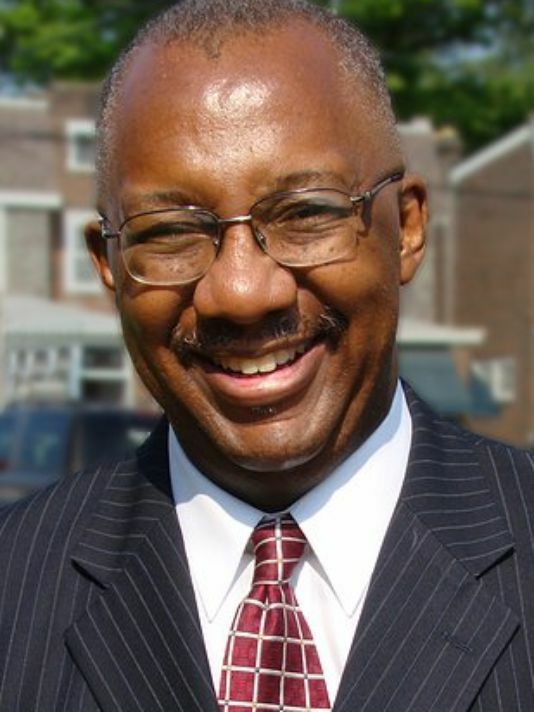 Furthermore, a study out of Cornell University found that in Delaware, a black defendant who kills a white victim is more than 6 times as likely to receive a death sentence than a black defendant who kills a black victim. While I was considering whether to sign or veto the death penalty repeal law in New Mexico, I invited people to contact me with their views. I heard compelling arguments from family members who had lost loved ones and from law enforcement officers concerned about their on-the-job safety. But I also heard equally compelling arguments from members of the clergy as well as from family members who also lost loved ones and from law enforcement officers who urged me to sign the repeal in New Mexico. I respected everyone’s opinions and took their experiences to heart, as I am certain that all Delaware state legislators are doing right now. As the Delaware House of Representatives considers Senate Bill 19, I would like to emphasize that repeal of the death penalty would actually keep Delaware families and communities safe. Senate Bill 19 is a tough bill: it will result in the state’s worst criminals being sentenced to life in prison without the possibility of parole. They will never get out of prison. They will never threaten our communities again. Those convicted of murder will die in prison. Since we repealed the death penalty in New Mexico, we have seen no big upswing in murder overall nor has there been a huge upswing in the death of law enforcement officers. In fact, our murder rate is down significantly, and let me add that not a single legislator who voted to repeal the death penalty in New Mexico lost his or her seat in a re-election bid because of that vote. More than 144 death row inmates have been exonerated across America since 1973—including four (4) New Mexicans—a fact that none of us can ignore. I feel deeply about this issue. Since leaving the governorship of New Mexico, I have become Co-Chairman of the International Commission Against the Death Penalty, traveling the world to make the case against its use. Many of the countries that continue to support and use the death penalty are also the most repressive nations in the world, including China, North Korea, and Iran. That is not good company for the United States or Delaware. In a society that values individual life and personal liberty above all else, where justice and not vengeance is the singular guiding principal of our criminal justice system, the potential for wrongful conviction and, God forbid, execution of an innocent person, stands as anathema to our very sensibilities as human beings. That’s why I am here in Delaware today—to urge members of the State House of Representatives to release Senate Bill 19 from committee and to bring it forward for a full House debate and an up or down vote. At the very, very least, Delaware deserves a vote on this important piece of legislation. It’s a matter of life or death. The presence or absence of the death penalty has no bearing on law enforcement deaths by homicide. States that have ended the death penalty tended to have fewer law enforcement deaths by homicide after their states ended the death penalty, confirming that the death penalty is not an effective method for protecting law enforcement officers from being killed. How can we keep the momentum going after Sr. Helen Prejean’s visit? Add your thoughts at our monthly DCODP meeting, this Monday 3/24/14 at 5:30 pm. LOCATION: Wilmington Friends Meeting House, 1st floor Social Room, 401 N. West St, Wilmington, DE 19801. Park in the parking lot on the 5th Street side or on the street. Ring the doorbell at the West Street entrance. Call 302-379-0488 for info. All are welcome! LOBBY DAY in support of SB 19 at Legislative Hall in Dover on Tuesday 3/18/14! In addition to her three speaking events, Delaware Repeal will host a lobby day with Sister Helen at Legislative Hall. Your participation in this event is a critical step in helping us pass Senate Bill 19. Join us in Dover to meet with your legislators and to be a part of the large number of people saying Senate Bill 19 deserves a vote. 12:00 pm – Walk over to Legislative Hall to lobby your legislator in support of the bill. Contact Sean Dwyer (Sean@derepeal.org) with any questions. With only a few months left in the legislative session, now is the time for us to repeal the death penalty. Join Sister Helen and The DE Repeal Project to make sure that Senate Bill 19 gets the vote it deserves. 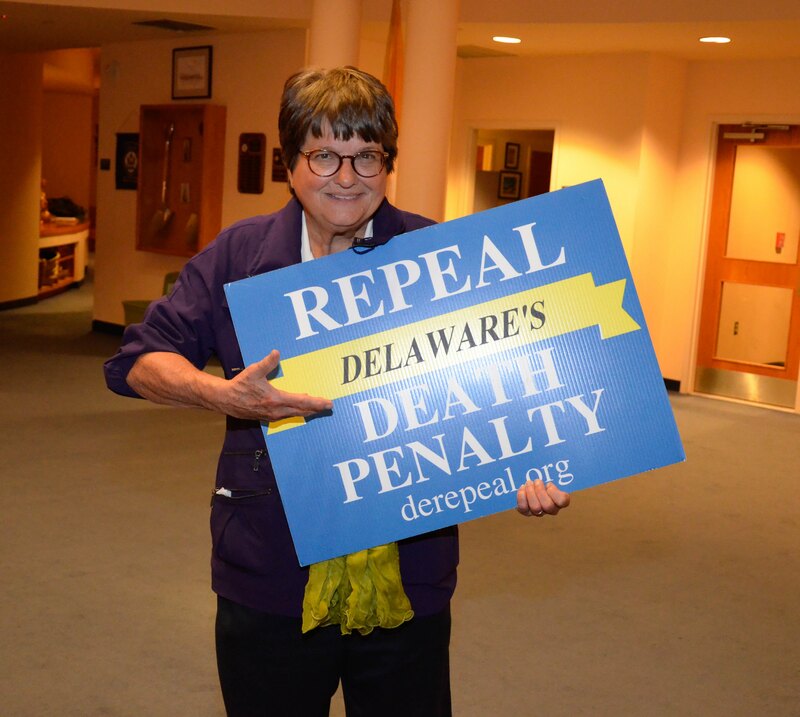 Sr. Helen Prejean returns to Delaware for 3 events in March! Sister Helen Prejean, author of Dead Man Walking, will return to Delaware this month! Spread the word about these 3 events and remember to bring a friend. Sister Helen’s book helped spark a national dialogue around the death penalty. She continues her work today as a prominent death penalty repeal activist working to change hearts and minds everywhere she goes. Her advocacy work has been an inspiration to many within this movement, and we are honored to have her back to help us end the death penalty in Delaware. Sister Helen last came to our state in October, where she held a press conference, spoke to hundreds of Delawareans, and hosted a breakfast with legislators. If you missed her last visit, we promise that you don’t want to miss her again. Tuesday, March 18th, 7:00pm Delaware State University 1200 N. Dupont Rd., Dover, DE Luna Mishoe Science Center in room 117. Saint Ann’s Catholic Church, 691 Garfield Parkway, Bethany Beach, Delaware, will host a free adult education panel on the death penalty this Thursday, March 13th at 7:00pm. Brian Boyle, Campaign Manager from the Delaware Repeal Project, will speak about Delaware’s death penalty and current legislation. Kristin Froehlich, whose brother was murdered, is the current Board President of Delaware Citizens Opposed to the Death Penalty. She will speak about how the death penalty harms victims’ family members. Barbara Lewis will speak about her experience as the mother of former death row inmate Robert Gattis, whose 1992 death sentence was commuted to life in prison without parole. Rev. Walt Everett, whose son was murdered, will speak about forgiveness. Check out the recent article in the Coastal Point newspaper. Please spread the word to friends and contacts in that area. Invite a friend who may be ambivalent or who supports the death penalty. Everyone will learn something. For more information, call (302) 539-6449.